Unipres is a specialist manufacturer of metal stampings and sub- assemblies for the automotive industry, serving brands such as Honda. The new site in Tyseley Park, south Birmingham, will create 80 advanced engineering jobs to service new contracts from motor manufacturers across the country. 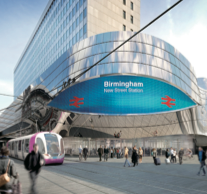 According to Graham Baines, financial director of Unipres UK, the location, a workforce with a solid backing of experience in the car manufacturing industry, and the quality of accommodation made Birmingham the winning destination. Sega Corporation is expanding from its European headquarters in west London with a new digital production studio in Solihull, Birmingham. According to Garry Dunn, the firm’s European Production vice-president, the studio will be home for a new product-development team of 15 designers, whose main task will be to develop innovative gaming platforms and work as part of the firm’s core technology group. Sonic the Hedgehog, Sega’s iconic video game character, celebrates its 20th anniversary ahead of the release of Sonic Generations, a new game expected to be launched in November.